It gave me a considerable thrill as our plane descended into La Palma to notice the Canary Island Spurge growing on hillsides. 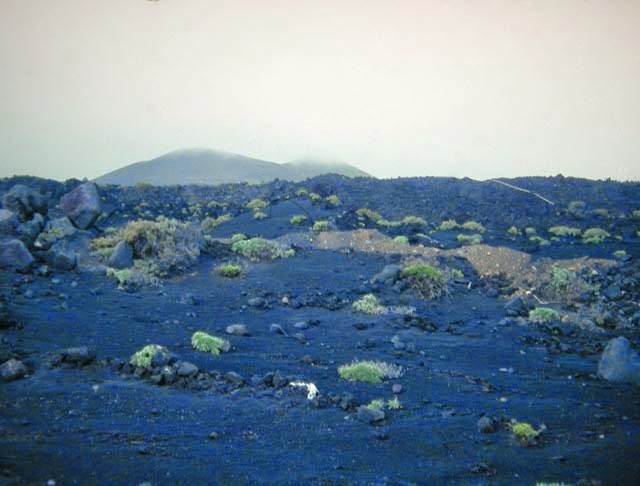 It was in December 2002 when my wife and I made our first visit to the Canary Islands. We had been intending to go to India, but a period of intense internal religious conflict made that trip impossible. At very short notice, we needed to find somewhere for a holiday. 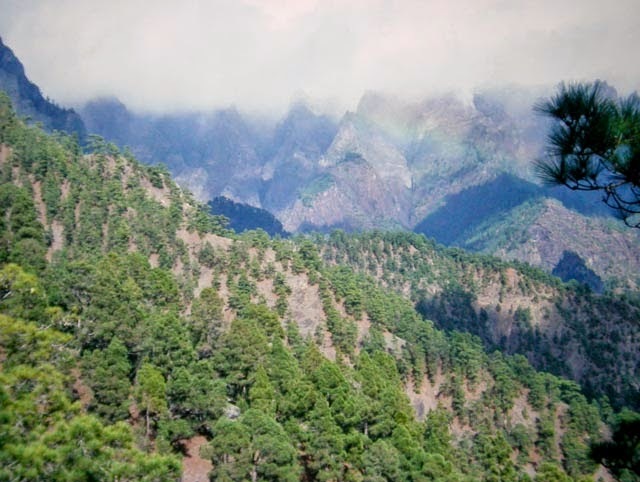 A stunning photograph in a brochure of the Caldera de Taburiente decided us, we chose La Palma. Our first experiences in La Palma were not as happy as they might have been. On the coach taking us to where we were to stay, I asked our tour operations representative about car hire. She gave the opinion that she doubted whether it would be possible. Our spirits took a further dive when the site of the hotel was indicated to us. It was a hotel with a beach, surrounded for miles by acre after acre of banana plantations. Luckily at the hotel reception, car hire presented no problems, so the next morning we had a car to take us around the island. 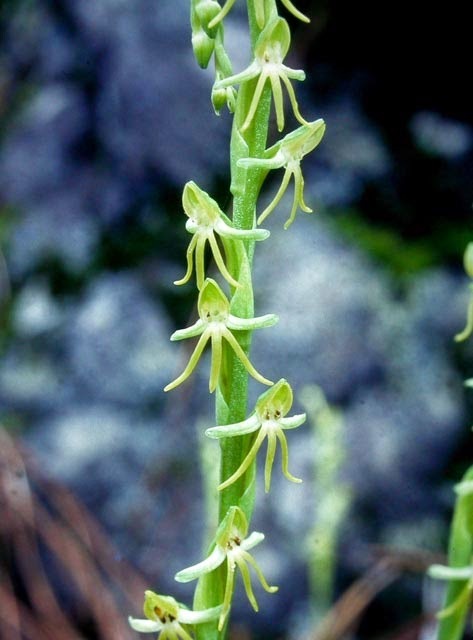 One species I did spot from the car in some quantity in an area of woodland was the orchid Habenaria tridactylites which was in fine flower. After I had taken a good series of photos, we drove towards the southern end, where the most recent volcanic activity on the island had taken place. 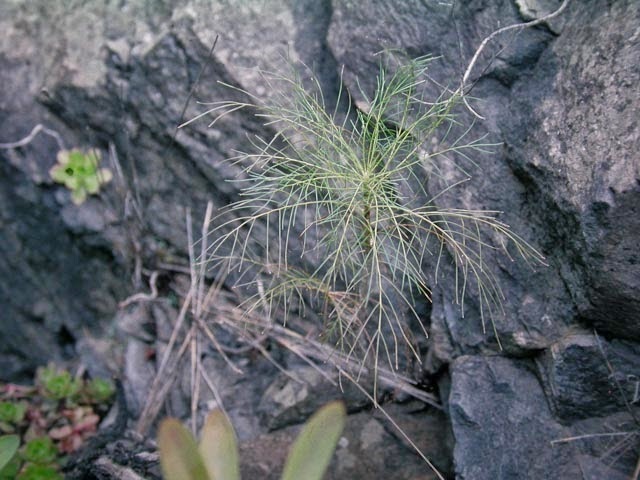 The vegetation was just recovering on the black volcanic ash, and a plant I was particularly pleased to see was Ceropegia hians. As we drove around the island, we began to spot fascinating species. 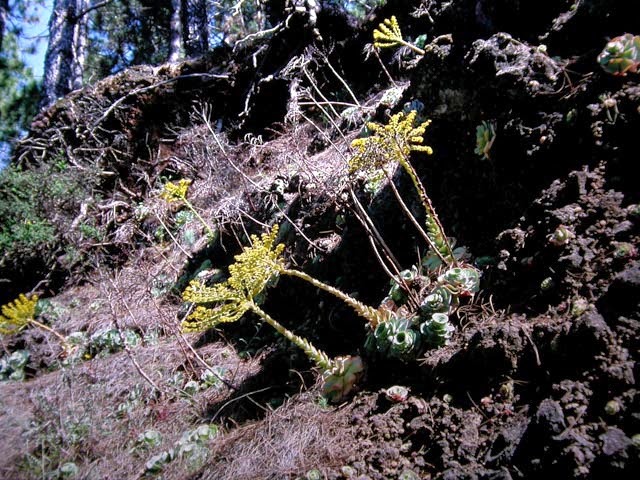 One of the most exciting genera in the Canary Islands is Sonchus - a bit of a surprise to many people. Luckily, La Palma is not highly populated, so stopping for roadside plants was not too dangerous. Plants photographed as we drove around included Sonchus palmensis, unfortunately not in flower, and Spartocytisus supranubius, both confined to La Palma in the Canaries. One day, we made a visit to the north of the island to pay our respects to a very important species. 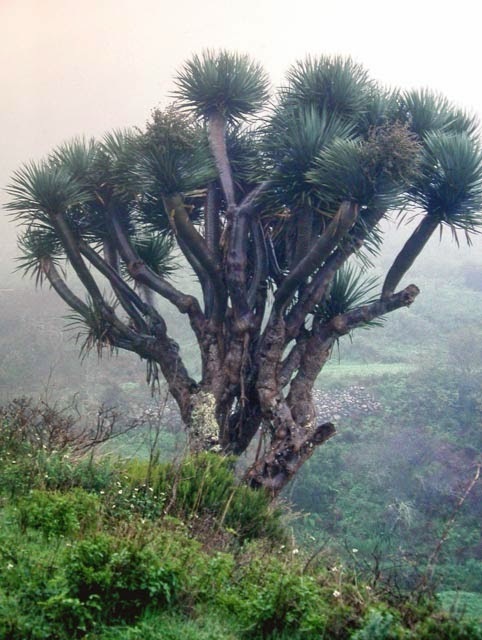 This was the Dragon Tree, Dracaena draco. Although easy enough to see planted in parks and gardens, it is very rare as a truly wild plant, and on this day we saw one or two genuinely wild trees. 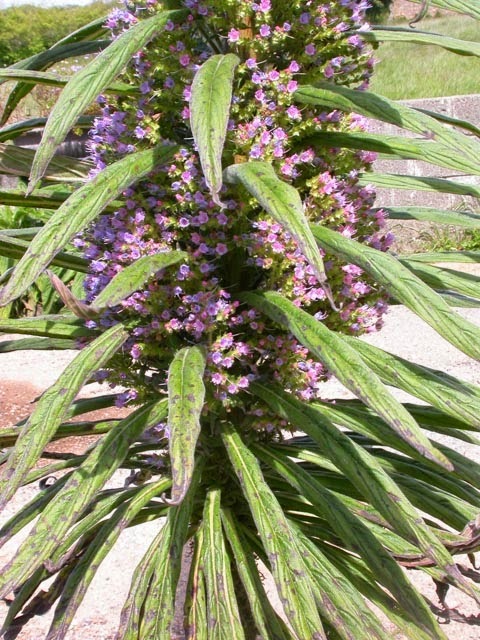 Another extremely rare plant in La Palma, and confined to it as a wild species, is Echium pininana. I have been to the valley in which it grows wild, but failed to see it. 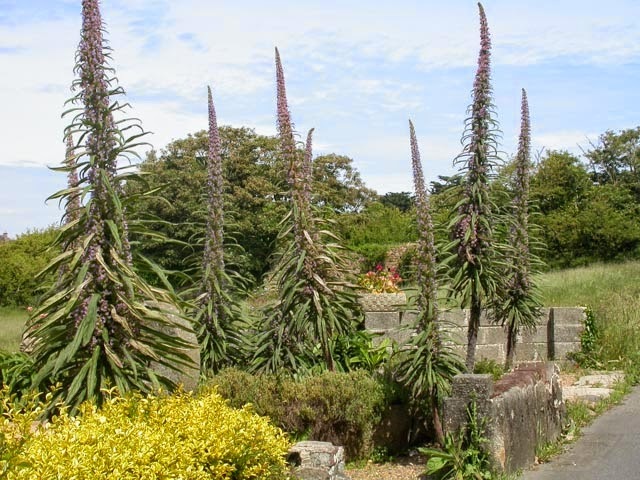 It grows extremely well in the Channel Islands, and is an escape from cultivation throughout the Isles of Scilly. 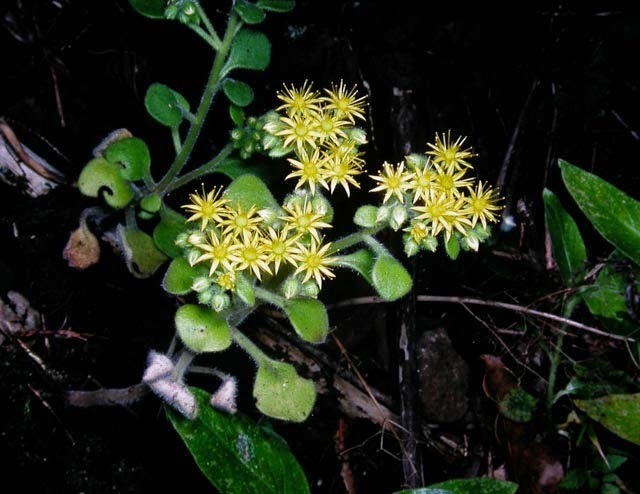 We only saw one species of the important genus Aeonium that was in flower. 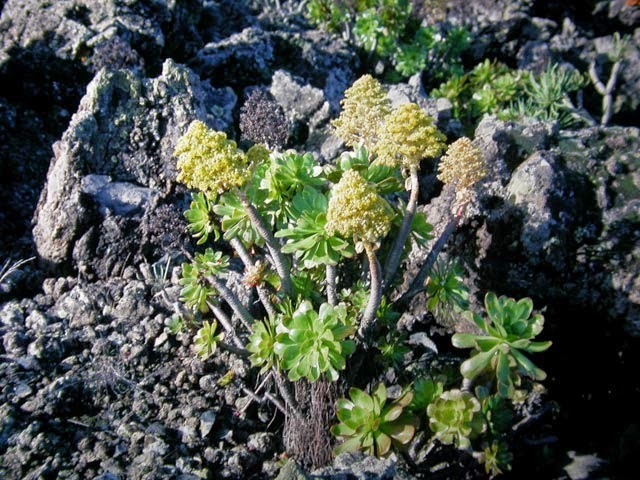 This was Aeonium holochrysum which was particularly frequent on the roofs of houses. We did not find too many plant species when we visited the Caldera de Taburiente, but the landscape and views were spectacular. Although not strictly a volcanic crater as it was formed by the erosion of a volcanic crater rather than through an eruption, it is enormous. 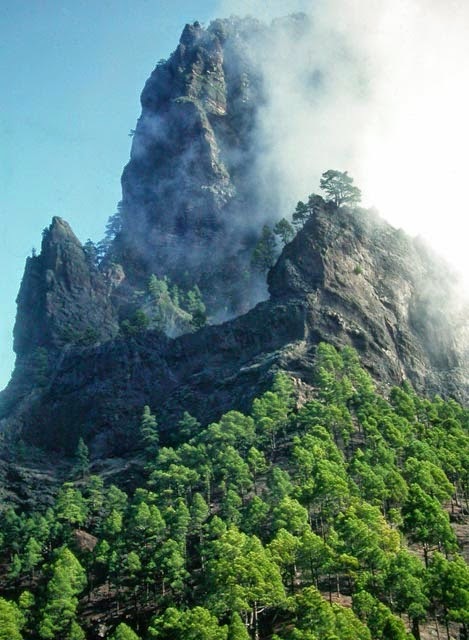 On the edge is a magnificent tower of rock, and on a promontory on its rim, there is Roque de los Muchachos. On it is an astronomic observatory, and the top is 7949 feet above sea level. It was warm and muggy in the Valley below when we visited it by car, but snowing hard with drifts when we reached the observatory. It would be interesting to know whether Mount Teide can be seen from all the Canary Islands. 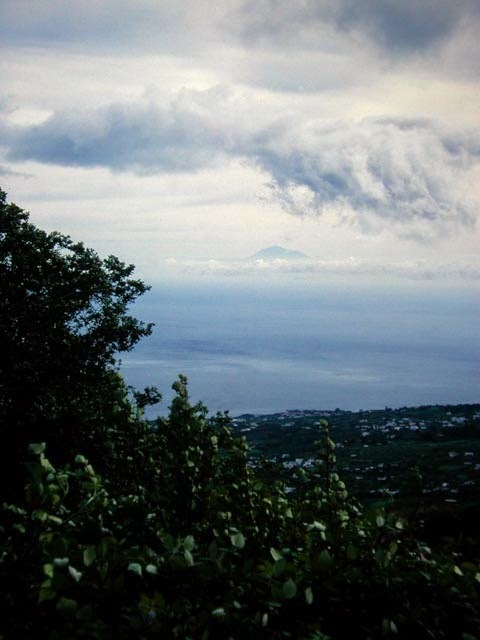 Certainly distant views may be had of it, usually rising above a cloud bank from La Palma. 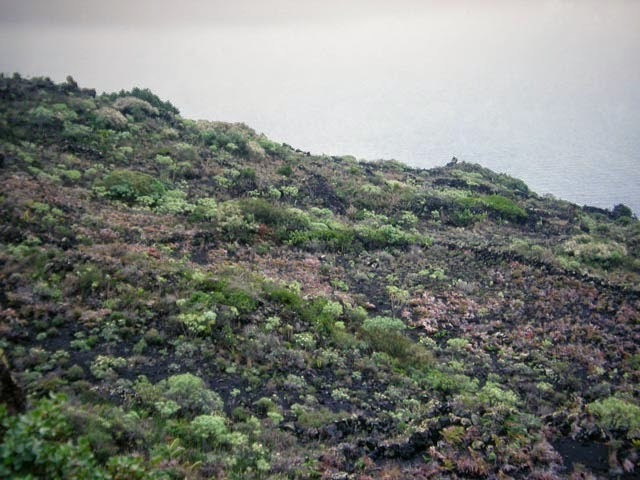 Another island well worth a visit by botanists visiting the Canary Islands is La Gomera. From Tenerife it is reached by ferry from Los Cristianos arriving in San Sebastian. En route, it is not unusual to see a pod of pilot whales, or the tiny sea bird, the Little Shearwater so rarely seen off Britain. 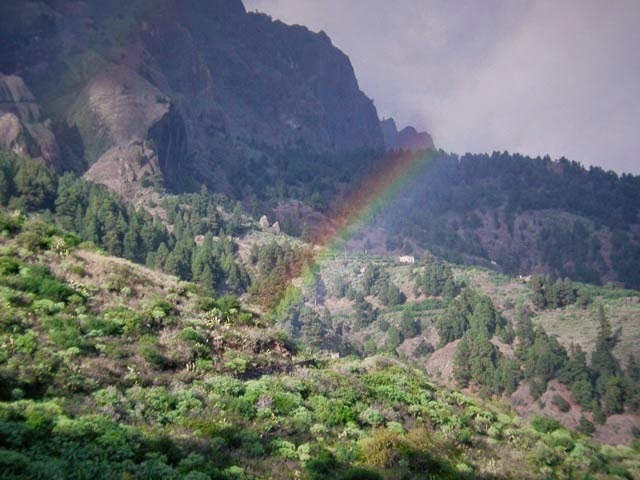 I have been to La Gomera twice, once when leading a party of naturalists, and once on holiday. On the second occasion, we took our hire car across on the ferry. From San Sebastian, a road takes the visitor up to the Garajonay National Park which is a World Heritage Site because of its ecology and endemic wild plants. Unlike Tenerife, it is wonderfully peaceful, and the roads are never crowded with cars. The roads passing through Garajonay go through woodland, but the road banks supply just the right conditions for many of the species endemic to the island. In other parts, the habitat is more open, and the countryside is dotted with the Canarian endemic palm, Phoenix canariensis along with a confusing array of bushy spurges, many of which grow in the island. 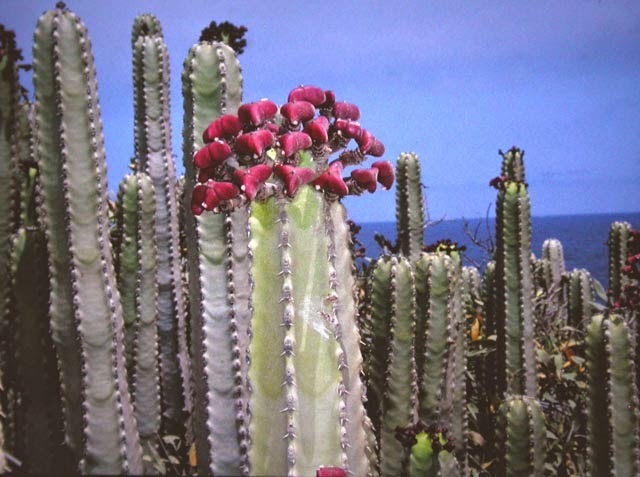 I believe I saw the rare Euphorbia lambii, but only through binoculars, so I was unable to photograph it. One great surprise after seeing the almost tree sized Sonchus species elsewhere on the islands is to find Sonchus wildpretii with its linear leaves. Unfortunately I have never seen it in flower, however I was lucky to see it at all as it is very rare. 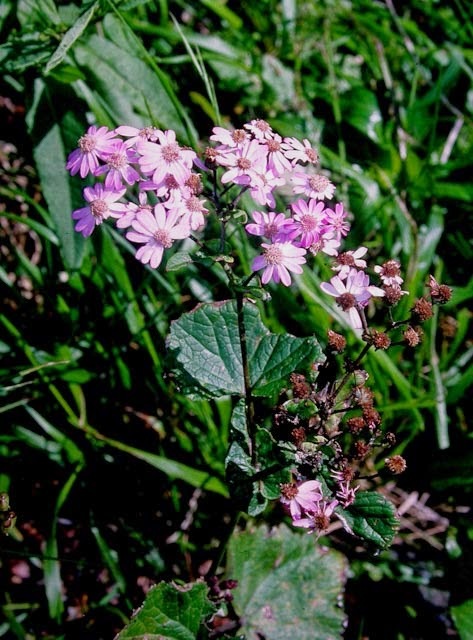 The genus Pericallis has many very beautiful Canarian members, but I personally prefer Pericallis steetzii as my favourite, seen occasionally on road banks in Garajonay. Two important endemics were seen on rocky ground with San Sebastian in the distance. 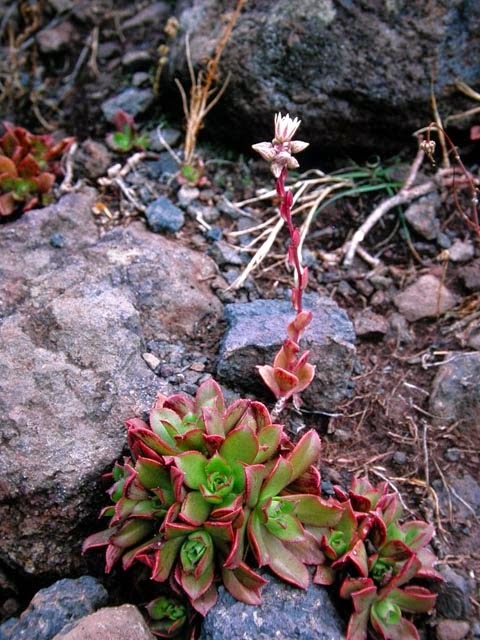 These were Aeonium decorum with its purple tinted leaves, and Sideritis lotsyi, similar in many ways to other endemic Sideritis species seen throughout the islands. 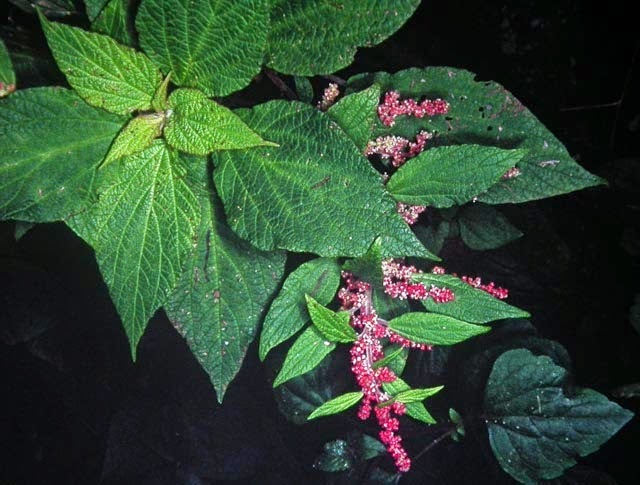 In shady places on the island where this photograph was taken, may be seen the quite harmless, but robust member of the nettle family Gesnouinia arborea. It also occurs on the other western Canary Islands. 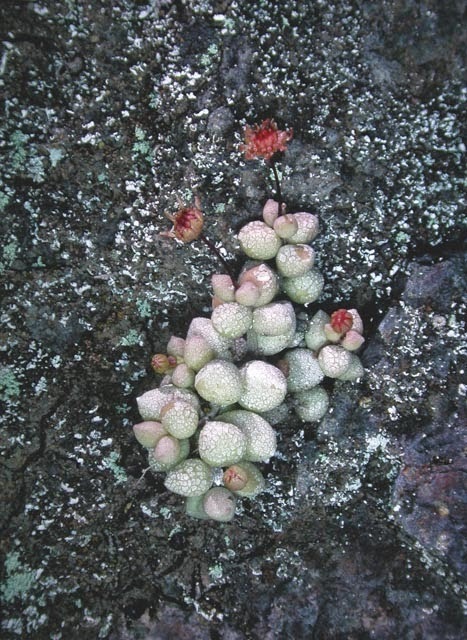 Three genera belonging to the stonecrop family are well represented in La Gomera. There are two species of Greenovia on La Gomera, one which is the common Greenovia aurea, the photo here was taken in Tenerife; the other is Greenovia diplocycla of which I am afraid I have no photograph. 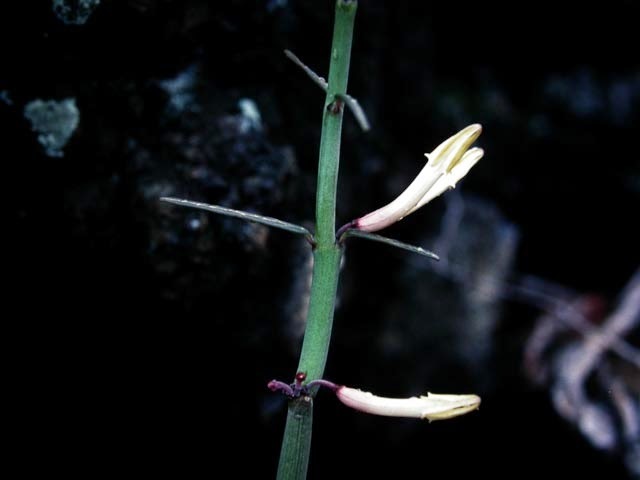 The genus Aichryson has rather delicate members, and several are present in La Gomera. 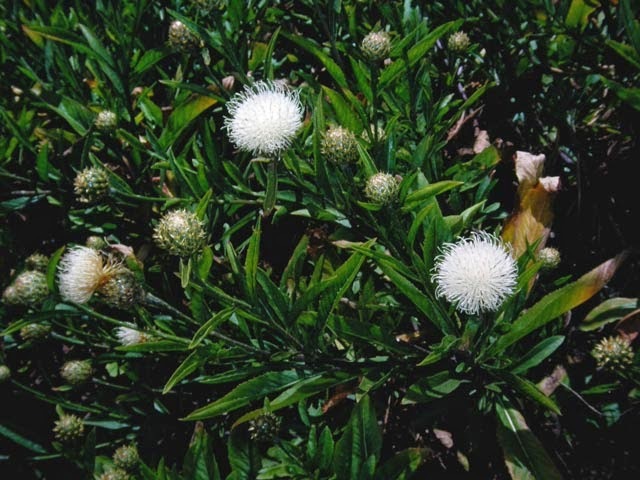 Seen here is Aichryson laxum. 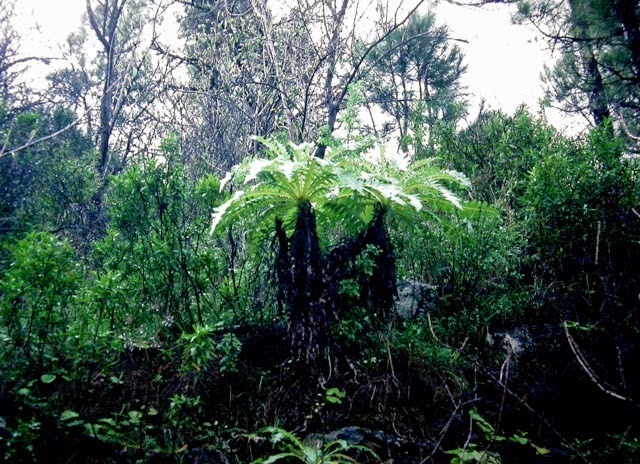 A strange little genus is Monanthes, which frequently has very swollen, and tinted leaves. Photographed here on La Gomera is one of the commonest species Monanthes laxiflora. 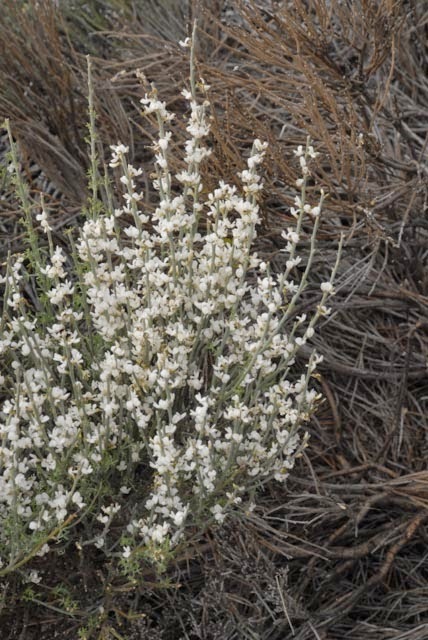 I have few photographs of members of this genus, and believe they are either shy of flowering, or have a short flowering season. At the far end of the Island from San Sebastian is a garden associated with the park visitor centre that contains many of the La Gomera endemics. 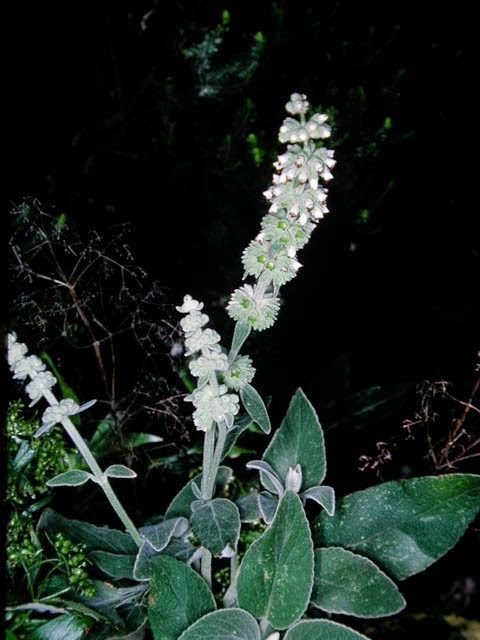 These include the La Gomera endemic Cheirolophus sataratensis. I did not see this in the wild, but I was able to photograph it in the grounds of the centre. Thank you for an informative and enjoyable article. The photos are especially good. Might you be able to recommend a field guide? I am going to the Canaries for the first time in October. Hi Nevil. Also at Selwyn. Live in E Sussex. Wild Flowers of the Canary Islands David Bramwell is excellent. More articles shortly. Fascinated to hear how you get on in Oct.
Hi Simon. I've just emailed via your consultancy website but forgot to ask if you could recommend a similar guide for Crete as I'm going at the end of August? Many thanks.